A follow on course from Stage 1 with the emphasis still on fun. Using games and structured sessions the instructors will guide and encourage you to practice skills and learn new techniques whilst building confidence and an awareness of safety. Generally we start 1 course a week on a Wednesday and run over 2 consecutive days. 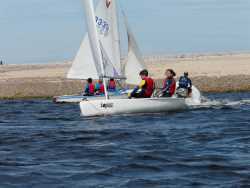 Basic sailing skills, ropework, collision avoidance. Can proceed Youth Stage 1. Student should have basic knowledge and steering ability.